Cows lactating during the dry season in northern Australia often lose weight as the pasture diet can’t provide enough protein and energy. The loss of body condition results in slow conception following calving, and ultimately low weaning rates. Good management of breeder nutrition starts with good pasture and grazing management. The next principle is the application of sound management in terms of mating and weaning management. Mating and weaning management can potentially have a significant impact on the nutritional requirements of breeders and their subsequent nutritional status. Dry season supplements should only be used to enhance effective management, not as the primary management tool to manage nutrition. Wet season supplements are necessary to correct major mineral deficiencies, which can impact significantly on feed intake, growth rates and fertility. The key mineral deficiency in northern Australia is phosphorus. BODY condition of breeders at the end of the dry season is an important factor driving fertility, weaner weights and mortality. The key objective is to keep breeders in moderate or store condition (i.e. 3 out of 5) or better. If a cow is in poor body condition (less than 3) there is a much greater likelihood of a failure to cycle (anoestrus). This is the biggest fertility problem in northern Australia: failure to re-conceive, largely due to nutrition. The primary strategy to sustain healthy ovarian function is to maintain body condition on breeders, by reducing the amount of condition lost during the dry season. As a cow is preparing her next potential pregnancy during her current pregnancy, a poor decision in managing ovarian function in the dry season will delay conceptions and reduce pregnancy rates following calving. This will delay and reduce calving the year after. The diagram below illustrates the factors that impact most on ‘dry season’ body condition, and also those that impact on ‘end of wet season’ body condition. The factors which impact on both ‘end of dry season’ and ‘end of wet season’ body condition are: seasonal conditions, pasture condition, country type, stocking rates, land condition and grazing management. These factors greatly influence pasture quality and quantity. Both pasture quantity and quality are important because both affect ‘intakes of dry matter’ and hence the nutritional status of the animal and therefore body condition. Time of calving and weaning. Seasonal mating is designed to reduce or eliminate dry season lactations. Weaning significantly reduces the nutritional requirements of a breeder as the extra energy and protein requirements needed for lactation are removed. Molasses and urea. Spike feeding is supplementing late pregnant cows with an energy concentrate (e.g. 2kg molasses and urea daily) for at least 50 days. This can help recover follicle development BEFORE calving and reduce the time to cycling and pregnancy after calving. For more information see Spike feeding. Urea dry licks to ‘plug’ the dry season protein shortfall in the diet and may assist with reducing weight loss. Phosphorus supplementation (if deficient in the dry season). Body condition at the end of the dry season. Time of calving (high nutritional requirements). Phosphorus. If cattle are deficient in phosphorus one of the symptoms is reduced feed intake and this will impact on body condition score. For different sized cows and heifers in different stages of lactation and pregnancy, nutritional needs can be quantified in terms of grams of protein and megajoules of metabolizable energy (MJ ME) required for maintenance. Female cattle have a high protein demand during pregnancy and lactation. If a high nutritional demand for protein corresponds with the worst time of the year for protein (the dry season) cows will lose weight rapidly, unless supplementary fed. When cows lose weight, healthy follicle development on the ovaries is slowed and after calving it may take a long time before the cow recycles and gets back in calf. Energy requirements are also highest during the latter stages of pregnancy and in early lactation. If there is not enough energy and protein during late pregnancy and early lactation, this also affects follicle development and cows may not recycle following calving. For more information see Nutrient requirements. If there is not enough energy for lactation, there may be reduced milk production and this will result in reduced weaner weights. This is why spike feeding with molasses usually results in an increase in weaner weights as well. Seasonal mating to match ‘the feed with the need’ (i.e. cows calve at the start of the wet season) and to minimise dry season lactations during time of poor pasture quality. Weaning before cows start to lose condition removes the stress and high nutritional demands of lactation. Weaning is a critical component and is most easily managed in seasonally mated herds. Pregnancy test, and separate and/or sell those cows which will calve at the wrong time of the year (i.e. those cows which have a high nutritional requirement at the driest time of the year). Segregate cows according to calving time and hence nutritional demand. Dry cows, wet empty cows and wet pregnant cows each have different nutritional requirements. This system reduces dry season supplementation costs by not having to feed all breeders. Dry season supplementary feed the whole breeder herd (for uncontrolled mating). This is the most costly system. Cows lactating in the dry season may not have their nutritional requirements met by a urea dry lick (see below). If seasonal mating results in the first calves dropping in the late dry season, feeding of M8U may then be required to correct the nutritional shortfall, particularly for heifers. This system of Spike feeding is to supplement late-pregnant heifers with an energy concentrate (1.5 to 2kg molasses and urea daily) for at least 50 days. This can help recover follicle development BEFORE calving and reduce the time to cycling and pregnancy after calving. Under poor pasture conditions in the dry season when crude protein levels maybe as low as 5% or lower, the shortfall in dietary protein for an average size lactating cow is approximately 480g. A 30% urea supplement will only supply 172g of protein if 200g per day is eaten. So for lactating cows it is difficult to fully correct this dry season protein shortfall with a urea dry lick. 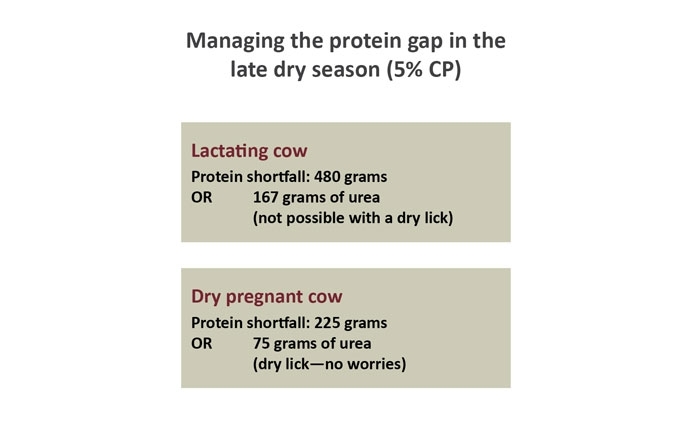 The example below shows that for a dry cow it is easier to correct the dry season shortfall in dietary protein, due to the lower nutritional requirements of a dry cow. Pasture diet quality can be assessed by using a tool called NIRS. For more information see Assessing pasture diet quality (NIRS). If there is a high production requirement, as with cattle that are growing, or are lactating and/or pregnant, there is also a high requirement for phosphorus. Peg leg and/or loss of hair. The amount of phosphorus cows and heifers need is closely related to intakes of protein and energy. Phosphorus levels in the pasture are higher in the wet season but this is also when nutritional requirements are higher and when phosphorus becomes the first limiting nutrient. For more information see Phosphorus supplementation. Management of pasture quantity and quality is critical to manage dry matter intakes and diet quality. Both these factors are critical to the level of nutrients in the pasture diets of grazing cattle. Take measures to improve mating and weaning management in order to manage the high nutritional demands of breeders during late pregnancy and lactation. Monitor ‘pasture diet quality’ with NIRS so that you can gauge the shortfall in dietary nutrients. This shortfall is the difference between what cattle need for production and what the pasture diet is supplying. Correct the ‘nutritional shortfall’. Once you have determined the shortfall in the diet you can then correct this by feeding the relevant nutrients in a cost effective manner.